A new graphic I made, titled "Moment of Grace". Go here for more! Flash Flood (from Skinner's POV) NC-17 January 2000 new!! It's post-Requiem yet again, and life is just about getting back to normal for everyone. Sort of. It's post-Requiem, way post Requiem, and things have progressed along without Mulder, and in many, many ways... Sometimes people show up at the most inconvenient moments, don't they? Disaster visits Walter Skinner's personal life, and coping with it leaves him floundering. Duncan MacLeod never asked to be involved, but fate intervenes. Together, they come face to face with some painful issues as their lives intersect between prevarication and grief, need and revelation, and both men must find new ways of thinking in the midst of change. Originally printed in the zine, "Wounded Heroes: Tales of the Big Guys"
Takes place sometime following the 7th season's last episode "Requiem". New graphic added February 23, 2001, "Abduction". A series spanning the 6th season, my way of uniting and explaining what was going on behind the scenes. Pure fluffiness in which things aren't always what they seem, but it then turns out everyone likes it that way. A post-Avatar Skinner must deal with his new life. Spring has sprung, and while on a case, the season seems to effect people in unique ways. A post-apocalyptic *work in progress* that will explore our intrepid X-Files characters and their journey into a brave new world. An anonymous seducer drives Skinner to the brink of...something. Scully faces upheaval when she finds out about Mulder and Skinner. Total and complete cotton candy for a smiling Skinner lover. An outsider's perspective on the relationship between our two favorite FBI guys. The shortest distance between two solitary points isn't always a straight path. the sequel to Small World...what happens on Monday morning afterwards. 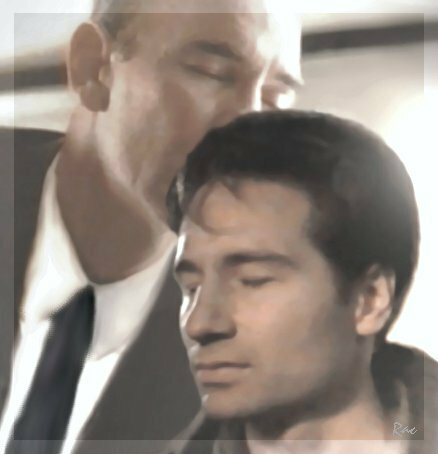 Mulder and Skinner in a re-invented late-night visit during the episode Zero Sum, an alternative vignette.